With wine, thai music and a seven course dinner, Jahn restaurant in the Conrad resort is a great place to be on New Year’s Eve. The restaurant is on a cliff overlooking the ocean, so those who arrive early will be able to start the countdown with the sun slowly descending over the horizon. On the stroke of midnight, this will be a great place to watch the fireworks. Entertainment also includes live music on the water, a cabaret show and a complimentary glass of champagne on the countdown, although couples receive a bottle. There is also a New Year’s Day brunch served between noon and 3:30 on January 1st with a complimentary glass of prosecco. Add a little glamour into the night at the Zazen Boutique gala. The evening starts with some pre-dinner cocktails and canapes at the Salon de Ti. It continues with a seven course dinner, including foie gras, Wagyu beef roll, sea bream udon with caviar, Belvedere vodka and kaffir lime granita, Phuket lobster and more. The evening finishes with two Thai dance shows, a cabaret act and the fireworks at midnight. Start the New Year feeling like royalty! Another place to get dressed up for is SALA Samui. Menu highlights include turbot crab salad with a glass of Albarino, Bresse chicken roulade with heirloom vegetables, Maine lobster with Alaskan halibut and King scallops and a“Valrhona” dessert – expensive, French premium chocolate. Entertainment includes a Bobby Parrs duo, cabaret shows, traditional Thai dance, fire show and Choeng Mon Beach fireworks. There is less eating to do here but the fun is equal to anywhere else. In the past the NYE parties at W Retreat have featured fire dances, local DJs and a complimentary glass of champagne for the countdown. This year guests can expect to feast on grilled tiger prawns, Australian prime rib of Wagyu beef and more. If you want a relaxed evening in shorts and a t-shirt with a beach dinner and plenty of space to let your hair down, that’s a great option. Reservations may not be necessary at local Thai places but, once you’ve found an ideal beachside venue, double-check that it will be open – many close or host parties for their staff. A reservation is a good idea if you have a big group or want a prime beach-front table. 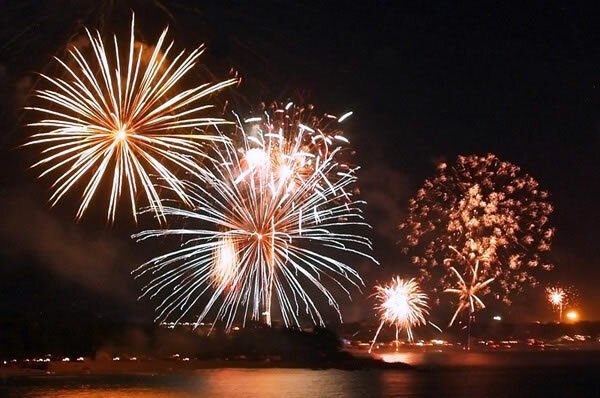 The rule of thumb for New Year’s Eve in Koh Samui is this, the bigger the beach, the bigger the fireworks. Whether you’ll be on a beach at midnight, or somewhere with a view – Koh Samui’s New Year fireworks are a great way to ring in the New Year. At smaller beaches, like Choeng Mon, the show is usually over by 1 am. This is great for families with young children. If you want a party with a capital P then head to Chaweng where you will find a raucous affair with celebrity DJs, huge crowds, lots of bars and a huge fireworks show. Staying in a luxury villa? Our Koh Samui villasare well equipped for all kinds of celebrations. If you’d rather not cook dinner, many restaurants do take-out or you could employ villa staff such as a Thai chef and butler for the evening.